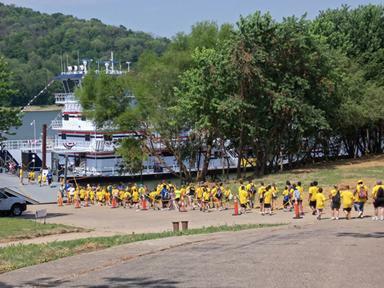 Some 3,400 children and adults toured the M/V Buckeye State at the Outdoor Adventure Expo at Coney Island. CINCINNATI, Ohio — Nearly 6,000 children from more than 100 schools, summer day camps and churches disconnected from the digital world June 21 and plugged into the world of nature at the 7th annual Kids Outdoor Adventure Expo at Coney Island. RiverWorks Discovery provided numerous hands-on exhibits including a working lock and dam model; 3-D puzzles of a paddlewheel and a towboat, and performances by a live storyteller. The kids also learned how to catch a fish, wear a life jacket, paddle a raft, reach the top of a climbing wall, throw a boomerang, navigate a barge through a lock and to test water for pollution. RiverWorks Discovery (RWD) was developed by AEP River Operations and has been supported by over 35 funding partners in the river industry. This highly successful educational program has now been adopted and is being expanded. RiverWorks Discovery is a national outreach education effort of the National River Center & Hall of Fame located at the National Mississippi River Museum & Aquarium. RWD is a coordinated effort which brings together the for-profit industry, community leaders, museums, nature centers, educators, and the general public in recognition of the role our rivers have played and will continue to play in our nation’s future.